A Mac computer running OS X Server to create an OS X configuration profile. 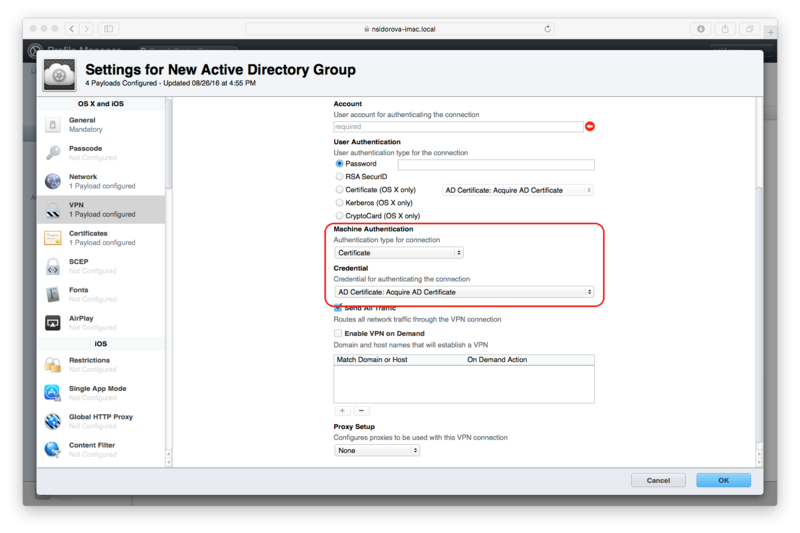 You will create a configuration profile using the OS X Serverâs Profile Manager. 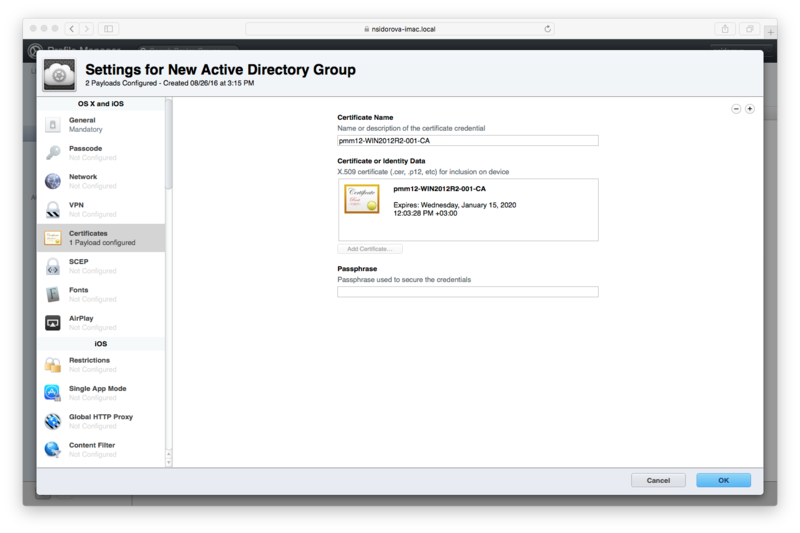 Note that the Profile Manager must have Device Management enabled in order to create a device profile with the Directory payload. 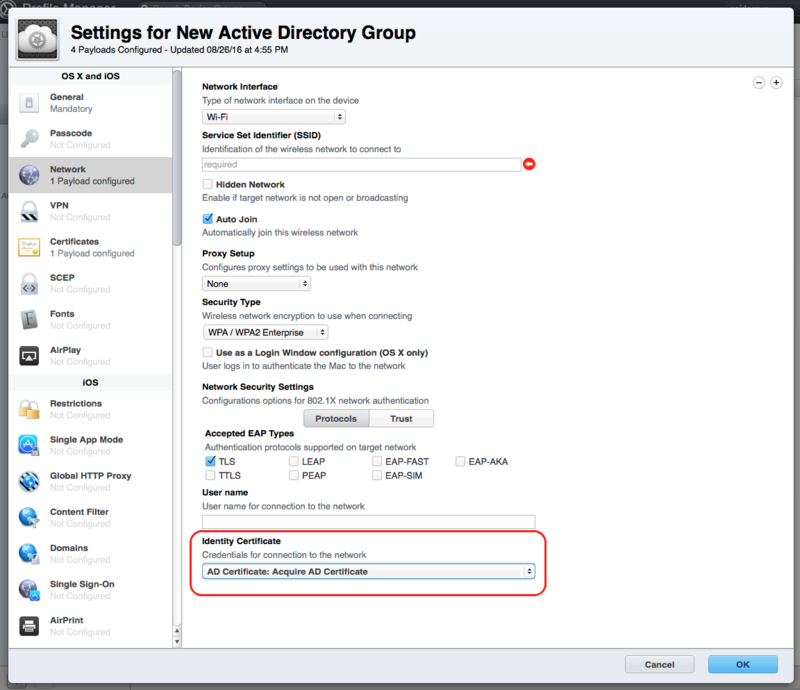 To verify, in OS X Server, go to Services > Profile Manager and make sure that the Device Management option is enabled. Please note that you cannot use a user profile because it does not include the Directory payload. Install a root certificate on each Mac computer to establish a chain of trust. This can be accomplished by using the Certificatespayload of the OS X configuration profile. Copy the exported certificate file to the Mac running OS X Server where youâll be creating an OS X configuration profile for your Mac computers. In the Certificate Templates list, find a template named âComputerâ, right click on it, and then click Duplicate Template in the context menu. â¢ In the Subject name format drop-down list, select Common name. â¢ In the Include this information in alternate subject name section, select the User principal name (UPN) option. Directory â for binding Mac to a domain. Certificates â for installing the root CA certificate on a Mac. 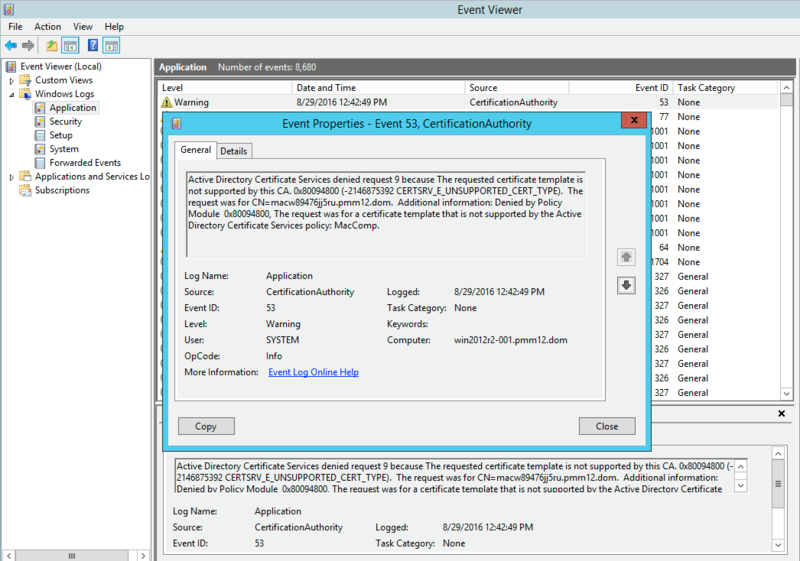 AD Certificate â with proper settings for requesting a certificate from the CA. Network and/or VPN â [optional] for joining a corporate Wi-Fi network or configuring a VPN connection using a digital certificate for authentication. Open the Profile Manager. If you havenât done so already, please verify that Device Management is enabled. 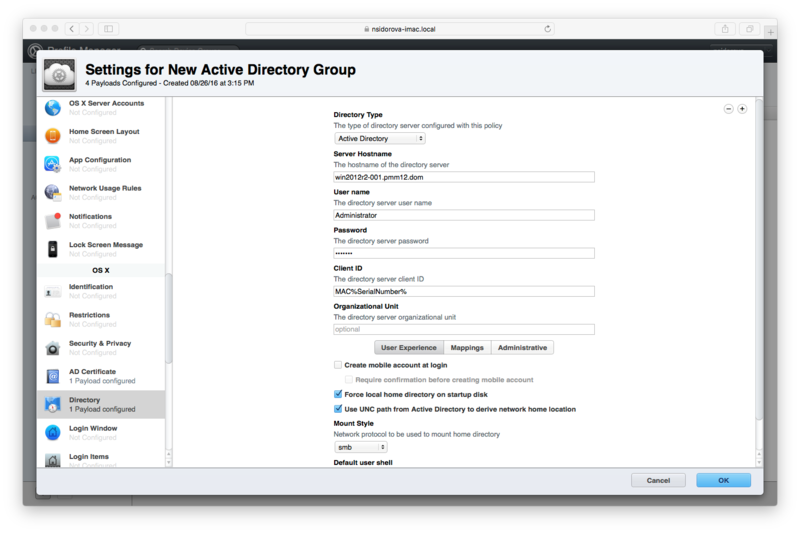 To do so, go to Services > Profile Manager and make sure that the Device Management option is enabled. Type a device group name (e.g. 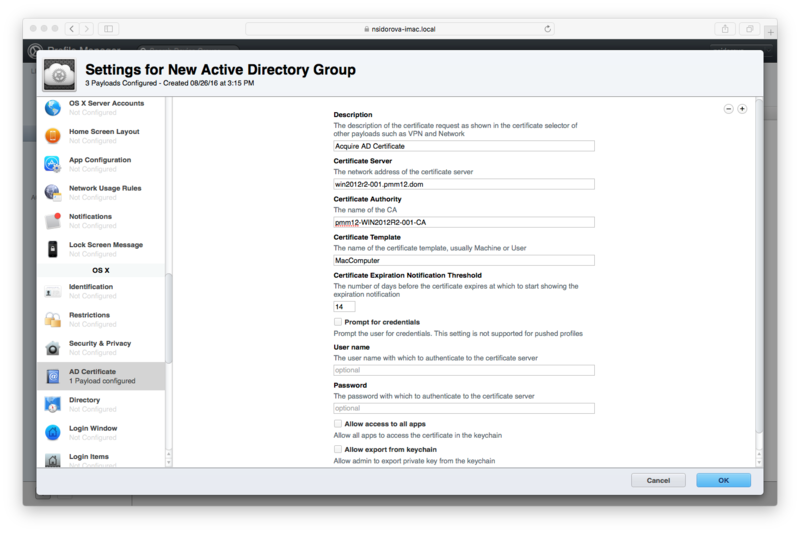 âNew Active Directory Groupâ). â¢ Certificate-based machine authentication is only supported for IPsec (Cisco) VPN tunnels. Other VPN types require different authentication methods. â¢ The account name field can be populated with a placeholder string. In the Mac OS X Configuration Profile dialog, type a name for the configuration item, then select System profile as the profile type and specify the configuration profile that you created earlier (the one with the â.mobileconfigâ extension).